A Beauty Must-Have! OLEHENRIKSEN Pure truth youth activating oil. Okay, so this might sound crazy, but I think I’ve found the “fountain of youth!” No, really, ladies! Listen up! If you want radiant, youthful looking skin that doesn’t cost you an arm and a leg, then I’ve got the answer for you. I, like most women in their..ahem, late 20’s, began to worry about wrinkles, large pores, etc. That’s when I decided to take a trip to my favorite beauty store, Sephora, and began my search for the perfect night cream which would prevent early signs of wrinkles, and keep my skin hydrated all night long. I also had acne prone skin growing up, so if something can keep my face clear of bums, I’m all for it. That is when I found this! I feel I can go without foundation and still look fresh! Not only does my skin look brighter and spot free, it’s glowing! It’s super active ingredients are 100% pure rose hips seed oil. This particular package comes with the super active duo: Pure truth youth activating oil and the Anti aging Serum. There aren’t too many women today who don’t have their own “beauty secrets.” Whether you’re a simple gal or a hot bollywood actress, women all over have some kind of beauty trick they swear by. Deepika Padukone reveals her beauty regime. The 5’9 beauty tells a source, her daily skincare regime includes a moisturizer with SPF (sun protection factor) during the day, and a hydrating cream, after removing all her make up at night time. Let’s not forget drinking plenty of water, eating balanced meals, regular workouts and adequate sleep, which are extremely important to her. “Since my work involves a lot of traveling and exposure to extreme climatic conditions, it ends up taking a toll on my hair. I get tender coconut hair oil massages at least once a week. It helps me protect my hair from any form of damage,” says the 27 year old. In troducing a jet-black mascara that lengthens, curls, volumizes, lifts, and separates lashes for a spectacular “out-to-here” look. 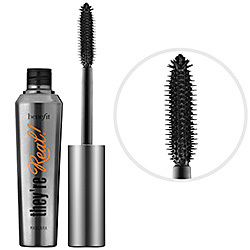 Jet-black goes the extra “length” to give you long, strong, beautiful looking lashes with just one application. Create that dramatic, sultry look in just seconds, with one of Benefit’s best creations. What it does: This mascara features an exclusive brush specially designed to maximize the performance of the long-wearing, glossy formula revealing lashes you never knew you had! Staggered bristles grab close to the root, boosting length and volume beyond belief. The precision bristles on the custom-domed tip lift, define, and curl even your tiniest lashes. The end result is luxurious, silky lashes that won’t smudge, clump, or dry out. If you follow my beauty articles on www.charlottestylemag.com, under “Beauty Product Must haves,” you can see I am a eye makeup fiend. I highly recommend this mascara to any girl who enjoys dressing up her peekers, without the hassle of applying fake lashes. It’s available in stores that carry Benefit products everywhere.